I’m willing to bet you’ve heard the myths….about wearing black, right? How it’s the magical color for all women to automatically make you look your best? I’m not going to lie, it IS one of my favorite colors to wear for T’s, tanks or sweaters. I just love it around my face! Coated black denim, YES…because it looks like leather without being leather (insert image of Ross with the baby powder and lotion!) But I digress…. Black is slimming. Well, it is, when it fits you proper. Too snug, like ANY piece of clothing that is too tight, black will definitely give the impression you are wearing clothes that don’t fit. What happens when we wear clothes that look too small? We look bigger! NO THANKS! So black can absolutely be slimming; but tight black can work against you. Yet if you wear it too big, it has the opposite effect…you are kind of lost in all the fabric. But I also feel it’s important to mention black is actually a super bold color! It stands out, which means so does anything you may be trying to cover up with it, which is why fit is crucial. Black leggings / yoga pants go with everything. Well, to an extent. They have a “busy on the go; but like to be comfy” vibe. They can also be dressed up SUPER easy, and I encourage you to take some creative license with your look. Maybe pair them with a really fun tunic / long in the back top, fun layers of delicate necklaces or a big statement one and some super cute shoes (or booties, or fashion sneakers, or whatever transforms the look!). Just because we embrace athleisure wear doesn’t mean that has to be our whole look right? Be an original girl! The world needs you! My only PSA on this, make sure those leggings are a nice tight, thick weave. When we are moving and shaking at exercise class or running errands, there is nothing worse than the material across your derriere being stretched too thin, and being more sheer than opaque. How do you know? Back up to a mirror, look over your shoulder, squat. Enough said. Black will always look sharp / professional. Ok, this IS true; but I’ve learned that some black garments only look sharp / professional when they are on the newer side. Denim FADES, and it doesn’t always fade to a great color, so make sure you transition those pieces down to your causal looks. Otherwise it can look a bit tired. I had a really fab pair of Mavi jeans in black a few years back, and while they were REAL SHARP in the beginning; after a few washes, they lost their luster and just didn’t pull my look together they way they used to. They got “Marie Kondo’d” stat! Consider this for anything denim, cotton, or a blend with those fabrics. Polyesters, wool, silks and rayon’s hold their color forever, so these are going to give you a consistent look anytime you decide to wear them. Black looks good on everyone. Actually….not true! JUST as not true as saying any other color in the color wheel looks good on everyone! Again, like I mentioned in Myth #1, black is BOLD. So it may actually wash some people out, might be too dramatic to their features, while for others it enhances your look. Don’t despair if you think black is just too stark for you, this is where toning it down to charcoal grey or beyond, is your happy place! Black goes with everything. Ugh…not necessarily. Black is great for grounding your outfit, but it doesn’t have to be with a article of clothing. It can be incorporated into any outfit (belt, bag, jewelry); but to say anything will go with a great pair of black trousers, is just not true. Black doesn’t pair as well with pastels, some lighter or jewel tones because its just so much compared to the softer tones. (This is where a heather or lighter grey works perfectly!). Now it DOES look good with stark white and other really saturated / deep colors like red, navy, royal purple, etc, etc.. And of course, patterns like plaid, color blocking and other classic looks. NOW….ALL THAT SAID, when you do find the right pieces to compliment, fit and flatter you, try out a monochrome look! It’s a super easy look to throw together in a rush, and can be sophisticated in a snap! 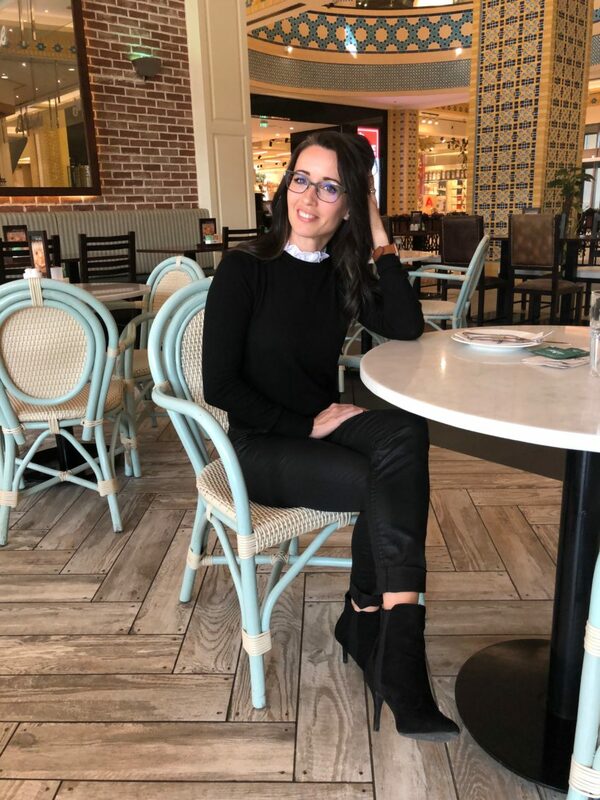 Recently I did some Sale Shopping here in Dubai, and I came across this incredibly soft and adorable, light knit black sweater, with THE CUTEST white ruffle collar! It is 100% polyester and I’m super impressed with how cozy and comfortable it is, while also having some structure. I’ve paired it with my high waisted black coated denim jeans from H&M. AMAZING option to give the look of leather pants and lend a pretty darn rocker chic edge to the outfit! The high waisted bottoms are the right choice for me with this sweater, since it does end up hitting me a bit high. Not sure I’m at the belly baring age anymore, NOR would I be comfortable with that. The high waisted jeans meets the shorter hem of the sweater perfectly! Notice anything different about my look? NO accessories! Who Am I??! THAT is a first for me in at least 8 years. But when I put this outfit together, I just loved the combination of the textures of the knit, the denim, the faux suede boots, and the white ruffle added some interest. I’ve got to tell you, in this Monochrome look, I felt like a million bucks. Kudos to my son who took this really great shot of me when we were having lunch together after an early release day! It was at the Ibn Battuda Mall here in Dubai…isn’t that the prettiest tile work you’ve ever seen?! The whole mall is just incredibly artistic and Instagram worthy! Yep, I’m in the mall bathroom…..but that mirror was HUGE! The pic ends up grainy because I tried to crop out the sinks, HA! That worked against me; but I wanted to share the whole look. I hope this article was helpful. I want to make sure to say that these are my thoughts on style based on my own personal experience, my interpretation of the message from some influencers I have learned from over the years, books I’ve read and and continue to read, and just how I take it all in. It’s my version of what I think it all means, and I just hope it helps you tweak YOUR style and your Method to making it happen, to be the best it’s ever been!